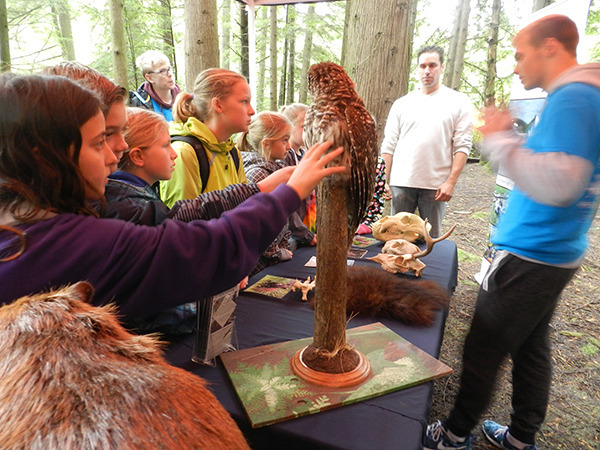 The Burns Bog Conservation Society held its second annual Stepping into Nature festival at the Delta Nature Reserve Oct. 10-13. The Burns Bog Conservation Society held its second annual Stepping into Nature festival at the Delta Nature Reserve Oct. 10-13. More than 350 Grade 6 and 7 students from Delta and Surrey unplugged and spent a day exploring the bog while learning about its ecosystem, conservation, and what role they can play in its management. Through hands-on activities at eight curriculum-based stations, the students connected with nature, practiced leadership skills and learned about their environment. For example, students discovered that the health of salmon-bearing waterways can be measured by looking at its bug populations. In preparation for this event, local environmental organizations Cougar Creek Streamkeepers, Earthwise Society, Northwest Wildlife Preservation Society, and Fraser River Discovery Centre helped train and mentor Grade 10 STRIVE leadership stu- dents from South Delta Secondary, who in turn gave informative and interactive lessons to the younger students. Eight hundred students were on a waitlist to attend the Stepping into Nature festival, and the society hopes to expand this education event in the coming years.